Radamel Falcao is not guaranteed an immediate first-team place at Manchester United, according to Reds' striker Robin van Persie. 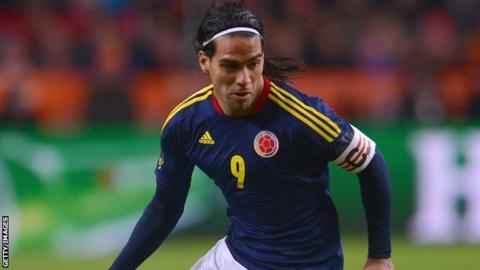 Colombia international striker Falcao, 28, joined United in a £6m season-long loan deal on transfer deadline day. "I welcome his arrival, he makes us better," Van Persie told Fox Sports NL. "At a top club you should always go for the best, which also fits my philosophy. Falcao must fight for his place, as I also have to." Falcao scored 11 goals in 20 appearances for French Ligue 1 side Monaco last season, before suffering a knee injury in January that kept him out of the World Cup in Brazil. There was some speculation he had been brought in by United to replace Van Persie, 31, who was rumoured to require knee surgery. "I am impressed that people have the imagination to invent something like that," said the Netherlands international, who moved to Old Trafford from Arsenal for £24m in August 2012 and scored 26 league goals in his first campaign to help United to the title. "I do not know where it comes from and can say with my hand on my heart that I won't be in a hospital to have the operation."